The photos of the killed police officers line the stage during a candle light vigil at City Hall on July 11, 2016, in Dallas. "This killing has to stop." Dr. Brian Williams, a Dallas-based trauma doctor, made that plea during a press conference Monday afternoon. Fighting back tears, Williams appeared with the emergency medical team who were on hand to treat the shooting victims Thursday night at Parkland Memorial Hospital after a sniper opened fire during a peaceful protest. Williams continued: "Black men dying and being forgotten. People retaliating against the people that are sworn to defend us. We have to come together and end all of this." 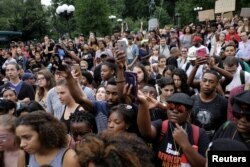 Like Williams, many Americans woke up Monday with an emotional hangover from last week's eruption of violence that left two African-American men dead (at the hands of police) and five police officers gunned down by a sniper during a peaceful demonstration, followed by more protests that resulted in the arrest of a leader of the Black Lives Matter movement. The confusion, anger and despair was evident as opinions spilled out — and sometimes over the line — in call-in shows broadcast on radio, television and, of course, in social media posts. 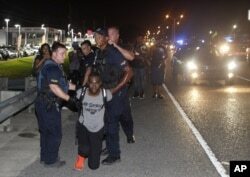 Police arrest Black Lives Matter leader DeRay McKesson during a protest along Airline Highway, a major road that passes in front of the Baton Rouge Police Department headquarters, July 9, 2016, in Baton Rouge, Louisiana. Take, for example, these excerpts from C-SPAN's call-in show Washington Journal, hosted by Pedro Echevarria early Monday. ​Anchor: Your thoughts on if there is an anti-police culture … Here's Diana from Halifax, Pennsylvania. Caller: ….a police officer has the most difficult job of anybody i know of. Just like all cultures, there are some that should not be there. Not well trained, whatever. On the whole, a lot do a good job. I think there is mentality building in this country over the shootings. Each one needs to be investigated, instead of immediately assuming something was done wrong by the police. Thank you. Caller: A thin blue line needs to be addressed where a police officer will back another police officer, even if he is wrong. That runs contrary to his sworn position and the constitution. Penal code, health and safety code, that is the basis for a lot of trouble in law enforcement. An officer who goes to excess, breaks rules, is not dealt with by other officers. There needs to be a periodic debriefing. There should also be a national academy for people to go for years like they do at West Point. It would break up the thin blue line. That line is stronger than the constitution, health and safety code, the penal code, and the sworn position the officer holds. Anchor: Are these things you have seen during your course of service? Caller: Absolutely. If you don't back up another officer, you can be ostracized. Caller: It is crazy. I have been watching the news. I wish people would call this out. I voted for President Obama; don't think I am a racist. When you have twice as many white people killed and shot so far this year, where are we getting off with the Black Lives Matter?... This is crazy. We have to try to get along somehow. I walked around Wal-mart here the other day and I bumped into a black lady and I said, 'Excuse me,' and she said, 'There is no excuse for white people.' I don't know what is going on in this country. Anchor: Let's hear from Benny, Stockton, California. Caller: I think there is a culture of policemen that doesn't care about black lives. When people are — black lives. We really do matter. I saw on TV: police are shooting a black man running away in the back. Michael Vick got two years in jail because he mistreated a dog. The white police officers are not getting convicted. It is always the shootings were justifiable. It doesn't matter what the circumstances were. We are recessing back to those days. [A] police officer should be convicted if he has done a crime. The way it is now, you can kill a black man and you get a medal. It is not fair. Anchor: Judy, Haines City, Florida. You are up next. Caller: I want to say America needs to come together and stand up for our officers. What are we going to do when ISIS comes in here and we have no officers to take up for us. President Barack Obama will address an interfaith memorial in Dallas, Texas on Tuesday for the five police officers killed by sniper Micah Xavier Johnson. The president will aim to soothe a country jarred by what many say is a national crisis involving guns, police violence, incidents seemingly driven by racism and few, if any, answers about how to solve any of it.